I was born in Vienna, Austria in 1930 . Already before the Nazis entered Austria in 1938, our life had changed significantly, even from the viewpoint of an eight year old. Among our neighbors were two boys of ages comparable to my brother, Robert, and me. They were our “best friends,” and we played regularly with them. In the spring of 1937, they suddenly refused to have anything to do with us and began taunting us by calling us “dirty Jew boys” when we foolishly continued to try to interact with them. On March 13, 1938, the German Nazi troops crossed the border into Austria and completed the Anschluss, the “joining” of Austria with Nazi Germany. A few days after the Anschluss, my mother, brother, and I left Austria by train for Switzerland on a “ski vacation.” My parents had been concerned about Hitler’s takeover of Austria for some time. For the previous three years, my Aunt Claire, who had studied in England, had been teaching English to me and my brother Bob. Well before March 13, train tickets had been purchased and a bed-and-breakfast “pension” had been reserved in Zurich. The most traumatic aspect of our departure was that my father was not allowed to come with us and had to give himself up to be incarcerated in the Vienna city jail. In part, he was kept as a hostage so that any money we had would not be spirited out of the country. My mother reassured my brother and me, saying that nothing would happen to him, though of course she herself had no assurance that this was true. At the end of the summer, the visas finally arrived, passage was booked, and the three of us were ready to leave for the United States. Although there had been no news from my father, he miraculously turned up at Le Havre a few days before our ship was scheduled to depart for New York. From my point of view, it was exactly what my mother had told me would happen: We would all go to America together. When my father joined us in Le Havre, Bob and I asked him what jail had been like. He told us that he had been treated well in jail and cheerfully described how he had passed the time teaching the guards to play chess. One aspect of my father’s personality, which strongly influenced both my brother and me, was to make something positive out of any experience. We arrived in New York Harbor early in the morning on October 8, 1938, and I stood on the deck watching the Statue of Liberty appear out of the mist. The symbolism associated with the Statue of Liberty may seem trite today (and somewhat deceptive given our present immigration policies), but in 1938 it was special for me. Most of the immigration formalities had been taken care of by Uncle Edu, so that a few hours after our arrival we boarded a train to Boston. During our initial weeks in the United States, we were lodged in a welcoming center in Brighton, where a large mansion had been transformed into an interim home for refugee families. We were taught about America (what it was like for foreigners to live in Boston), given lessons to improve our English, and aided in the steps required to be allowed to remain in the United States as refugees. Soon we were ready to start a new life. My parents rented a small apartment in Brighton (part of Greater Boston), and Bob and I immediately entered the local public schools, as we had in Zurich. Motivated by their concern for our education, my parents then moved to Newton (a suburb of Boston), where the schools were recognized as superior to the Boston public schools. My parents bought a small house in a pleasant neighborhood in West Newton, and I attended the Levi F. Warren Junior High School. My junior high teachers soon realized that I was bored with the regular curriculum, so they let me sit in the back of the classroom and study on my own. What made this experience particularly nice was that another student, a very pretty girl, was given the same privilege, and we worked together. The arrangement was that we could learn at our own pace without being responsible for the day-to-day material but had to take the important exams. Several dedicated teachers at Warren Junior High helped us when questions arose, particularly with science and mathematics. With this freedom, we explored whatever interested us and, of course, did much more work than we would have done if we were only concerned with passing the required subjects. When we moved to Newton, Bob was given a chemistry set, which he augmented with materials from the high school laboratory and drug stores. He spent many hours in the basement generating the usual bad smells and making explosives. I was fascinated by his experiments and wanted to participate, but he informed me that I was too young for such dangerous scientific research. My plea for a chemistry set of my own was vetoed by my parents because they felt that this might not be a good combination – two teenage boys generating explosives could be explosive! Instead, my father had the idea of giving me a Bausch and Lomb microscope. Initially I was disappointed – no noise, no bad smells, although I soon produced the latter with the infusions I cultured from marshes, sidewalk drains, and other sources of microscopic life. I came to treasure this microscope, and more than 60 years later it is still in my possession. One especially rewarding aspect of my working with the microscope was that my father, who was a thoughtful observer of nature, spent a lot of time with me and was always ready to come and look when I had discovered something. I had found an exciting new world and looked through my microscope whenever I was free. The first time I saw a group of rotifers I was so excited by the discovery that I refused to leave them, not even taking time out for meals. They were the most amazing creatures as they swam across the microscope field with their miniature rotary motors. (The rotifers come to mind today in relation to my research on the smallest biological rotatory motor, F1-ATPase.) My enthusiasm was sufficiently contagious that I even interested some of my friends. It was a special occasion when they came to my house and looked at the rotifers through the microscope. This was the beginning of my interest in nature study, which was nurtured by my father and encouraged by my mother, even though it was still assumed that I would go to medical school and become a doctor. One day my closest friend, Alan MacAdam, saw an announcement of the Lowell Lecture Series (a Boston institution, originally supported by a Brahmin family – the Lowells), which organized evening courses on a wide range of subjects at the Boston Public Library that were free and open to the public. The series that had caught Alan’s eye was entitled “Birds and Their Identification in the Field,” to be given by Ludlow Griscom, the curator of ornithology at the Museum of Comparative Zoology at Harvard University. Alan and I occasionally walked in the green areas in Newton, particularly the Newton Cemetery, and looked for birds with my father’s old pair of binoculars. Together we attended the first lecture, which had a good-sized audience, although it was not clear whether most of the people came simply to have a nice warm place in winter rather than because of their interest in birds. I was enthralled by the lecture, which provided insights into bird behavior and described the large number of different species one could observe within a 50 mile radius of Boston. I was amazed that it was possible to identify a given species from “field marks” evident even from a glimpse of a bird, if one knew how and where to look. Alan did not attend the subsequent lectures, but I continued through the entire course. At the end of the fourth or fifth lecture, Griscom came up to me and asked me about myself. He then invited me to join his field trips, and a new passion was born. From that time on, my treasured microscope was relegated to a closet, and I devoted my free time to observing birds on my own, as well as with Griscom and his colleagues, with the Audubon Society, and other groups that organized field trips. I entered Harvard in the fall of 1947. There was never any question about my wanting to attend Harvard and I did not apply to any other school. In addition to the Westinghouse scholarship, I received a National Scholarship from Harvard to cover the cost of living on campus. Otherwise I would have had to live at home to save money. I would not have minded this, since I was not a rebellious teenager eager for independence and distance from my parents. However, as I soon discovered, much of the Harvard experience took place outside of classes at dinner and in evening discussions with friends. At first I still intended to go to medical school but changed my mind during my freshman year. My teenage ornithological studies, fostered by Griscom and Donald Griffin, with whom I had gone on a field trip to Alaska, had already introduced me to the fascinating world of research, where one is trying to discover something new (something that no one has ever known). I began to think about doing research in biology, but concluded that to approach biology at a fundamental level (“to understand life”), a solid background in chemistry, physics, and mathematics was essential. I enrolled in the Program in Chemistry and Physics. This program, unique to Harvard at the time, exposed undergraduates to courses in both areas at a depth that they would not have had from either one alone. Although I shopped around for advanced science courses to meet the rather loose requirements, I also enrolled in Freshman Chemistry because it was taught by Leonard Nash. A relatively new member of the Harvard faculty, Nash had the deserved reputation of being a superb teacher. Elementary chemistry in Nash’s lectures was an exciting subject. A group of us (including DeWitt Goodman, Gary Felsenfeld, and John Kaplan – my “crazy” roommate, who became a law professor at Stanford) had the special privilege that Nash spent extra time discussing with us a wide range of chemical questions, far beyond those addressed in the course. The interactions in our group, though we were highly competitive at exam times, were also supportive. This freshman experience confirmed my interest in research and the decision not to go to medical school. Harvard provided me with a highly stimulating environment as an undergraduate. I enrolled in a wide range of courses, chosen partly because of the subject matter and partly because of the outstanding reputation of the lecturers; these courses included one in Democracy and Government and another in Abnormal Psychology. More related to my long-term interests were George Wald’s Molecular Basis of Life and Kenneth Thimann’s class on plant physiology with its emphasis on the chemistry and physiology of growth hormones (auxins) in plants. Both professors were inspiring lecturers and imbued me with the excitement of the subject. These courses emphasized that biological phenomena (life itself) could be understood at a molecular level, which has been a leitmotif of my subsequent research career. Wald’s course also introduced me to the mechanism of vision, which led to my first paper on a theoretical approach to a biological problem . Rather than taking the Elementary Organic course taught by Louis Fieser, I enrolled in Paul Bartlett’s Advanced Organic. It taught the physical basis of organic reactions. It was an excellent course, though difficult for me because one was supposed to know many organic reactions, which I had to learn as we went along. At one point, Bartlett suggested that we read Linus Pauling‘s Nature of the Chemical Bond, which had been published in 1939 based on his Baker Lectures at Cornell. The Nature of the Chemical Bond presented chemistry for the first time as an integrated subject that could be understood, albeit not quite derived, from its quantum chemical basis. The many insights in this book were a critical element in orienting my subsequent research in chemistry. At the end of three years at Harvard I needed only one more course to complete the requirements for a bachelor degree. During the previous year I had done research with Ruth Hubbard and her husband, George Wald. (Although Hubbard was scientifically on par with Wald, she remained a Senior Research Associate, a nonprofessorial appointment, until very late in her career when she was finally “promoted” to Professor. This was not an uncommon fate for women in science.) I mostly worked with Hubbard on the chemistry of retinal, the visual chromophore. When I brought up my need to find a course for graduation, Wald suggested that I enroll in the physiology course at the Marine Biological Laboratory in Woods Hole, Massachusetts. This course was one of the few non-Harvard courses that was accepted for an undergraduate degree by the Faculty of Arts and Sciences. The physiology course was widely known as a stimulating course designed for postdoctoral fellows and junior faculty. The lectures in the course by scientists who were summering at Woods Hole, while doing some research and enjoying boating and swimming, offered students a state-of-the-art view of biology and biological chemistry. In considering graduate school during my last year at Harvard, I had decided to go to the West Coast and had applied to chemistry at the University of California at Berkeley and to biology at the California Institute of Technology (Caltech). Accepted at both, I found it difficult to choose between them. Providentially, I visited my brother, Bob, who was working with J. R. Oppenheimer at the Institute of Advanced Studies in Princeton, New Jersey. Bob introduced me to Oppenheimer, and briefly to Einstein. When Oppenheimer asked me what I was doing, I told him of my dilemma in choosing between U.C. Berkeley and Caltech for graduate school in chemistry or biology. He had held simultaneous appointments at both institutions and strongly recommended Caltech, describing it as “a shining light in a sea of darkness.” His comment influenced me to choose Caltech, and I discovered that Oppenheimer’s characterization of the local environment was all too true. Pasadena itself held little attraction for a student at that time. However, camping trips in the nearby desert and mountains and the vicinity of Hollywood made up for what Pasadena lacked. At Caltech, I joined the group of Max Delbrück in biology. He had started out as a physicist but, following the advice of Niels Bohr, had switched to biology. 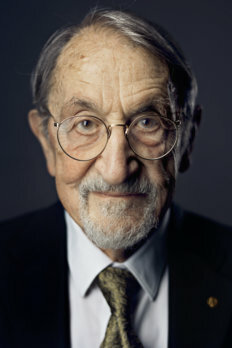 With Salvador Luria and others, he had been instrumental in transforming phage genetics into a quantitative discipline. His research fascinated me, and I thought that working with such a person would be a perfect entrée for me to do graduate work in biology. After the devastating exchange with Delbrück, I spoke with George Beadle, the chairman of the Biology Department. He suggested that I find someone else in the department with whom to do graduate research. However, I felt that I wanted to go “home” to chemistry and asked him to help me make the transfer. Once in the Chemistry Department, I joined the group of John Kirkwood, who was doing research on charge fluctuations in proteins, as well as on his primary concern with the fundamental aspects of statistical mechanics and its applications. I undertook work on proteins and the research started out well. In the spring of 1951, as I was getting immersed in my research project, Kirkwood received an offer from Yale. Linus Pauling, who was no longer taking graduate students, asked each student who was working with Kirkwood whether he would like to stay at Caltech and work with him. I was the only one to accept and, in retrospect, I think it was a very good choice. Initially, I was rather overwhelmed by Pauling. Each day upon arriving at the lab, I found a hand-written note on a yellow piece of paper in my mailbox which always began with something like “It would be interesting to look at …” As a new student I took this as an order and tried to read all about the problem and work on it, only to receive another note the next day beginning in the same way. When I raised this concern with Alex Rich and other postdocs, they laughed, pointing out that everyone received such notes and that the best thing to do was to file them or throw them away. Pauling had so many ideas that he could not work on all of them. He would communicate them to one or another of his students, but he did not expect a response. After I got over that, my relation with Pauling developed into a constructive collaboration. The time at Cal Tech was very rewarding, all the more so because of the intellectual and social atmosphere of the Chemistry Department. The professors – like Pauling, Verner Schomaker, and Norman Davidson – treated the graduate students and postdoctoral fellows as equals. We participated in many joint activities that included trips into the desert, as well as frequent parties held at our Altadena house, where Feynman would occasionally come and play the drums. One day in October 1953, Pauling came into the office I shared with several postdocs and announced that he was leaving in three weeks for a six-month trip and that “it would be nice” if I finished my thesis and had my exam before he left. This was eminently reasonable, since I had finished the calculations some months before and I had received a National Science Foundation (NSF) postdoctoral fellowship to go to England that fall. Pauling’s “request” provided just the push I needed, even though the introduction was all I had written thus far. With so much to get done, I literally wrote night and day, with my friends typing and correcting what I wrote. In this way, the thesis was finished within three weeks, and I had my final PhD exam and celebratory party before Pauling left. After a brief visit with my parents in Newton, I took an ocean liner for England and arrived shortly before Christmas 1953. During my two years in Oxford as a postdoctoral fellow, I spent much of the time traveling throughout Europe and taking photographs; they are the basis of several exhibitions. Also, I spent more time thinking about chemical problems than actually solving them. My aim was to find areas where theory could make a contribution of general utility in chemistry. I did not want to do research whose results were of interest just to theoretical chemists. Reading the literature, listening to lectures, and talking to scientists like Don Hornig and the Oxford physicist H. M. C. Pryce, I realized that magnetic resonance was a vital new area. Chemical applications of magnetic resonance were in their infancy and it seemed to me that nuclear magnetic resonance (NMR), in particular, was a field where theory could make a contribution. I concluded that a quantum mechanical approach could aid in interpreting the available experimental results and propose new measurements. As my postdoctoral fellowship in Oxford (1953–1955) neared its end, I was looking for a position to begin my academic career in the United States. With my growing interest in magnetic resonance, I focused on finding an institution that had active experimental programs in the area. One of the best schools from this point of view was the University of Illinois, where Charles Slichter in Physics and Herbert Gutowsky in Chemistry were doing pioneering work in applying NMR to chemical problems. The University of Illinois had a number of openings in Chemistry at that time because the department was undergoing a radical renovation; several professors, including the chairman Roger Adams, had retired. Pauling recommended me to the University of Illinois and the department offered me a job without an interview. I accepted the offer from Illinois without visiting the department, something unimaginable today with the extended courtships that have become an inherent part of the academic hiring process. The University of Illinois offered me an Instructorship at a salary of $5000 per year; the department offered nothing like the present-day start-up funds, and I did not think of asking for research support. Having had such a good time as a postdoctoral fellow traveling in Europe, I was ready to get to work, and Urbana-Champaign seemed like a place where I could concentrate on science with few distractions. The presence of four new instructors – Rolf Herber, Aron Kupperman, Robert Ruben, and me – plus other young scientists on the faculty, such as Doug Applequist, Lynn Belford, and E. J. Corey, led to a very interactive and congenial atmosphere. I focused a major part of my research on theoretical methods for relating nuclear and electron spin magnetic resonance parameters to the electronic structure of molecules. The first major problem I examined was concerned with proton-proton coupling constants, which were known to be dominated by the Fermi contact interaction. What made coupling constants of particular interest was that for protons that were not bonded to each other, the existence of a nonzero value indicated that there was an interaction beyond that expected from localized bonds. In the valence bond framework, which I used in part because of my training with Pauling, nonzero coupling constants provide a direct measure of the deviation from the perfect-pairing approximation. To translate this qualitative idea into a quantitative model, I chose to study the HCC’H’ fragment as a function of the HCC’H’ dihedral angle, a relatively simple system consisting of six electrons (with neglect of the inner shells). I believed that it could be described with sufficient accuracy for the problem at hand by including only five covalent valence-bond structures. To calculate the contributions of the various structures, I introduced semi-empirical values of the required molecular integrals. Although the HCC’H’ fragment is relatively simple, the calculations for a series of dihedral angles were time consuming and it seemed worthwhile to develop a computer program. This was not as obvious in 1958 as it is now. Fortunately, the ILLIAC, a “large” digital computer at that time, had recently been built at the University of Illinois. If I remember correctly, it had 1000 words of memory, which was enough to store my program. The actual program was written by punching holes in a paper tape. If you made a mistake, you filled in the incorrect holes with nail polish so that you could continue the program; the output appeared on spools of paper. Probably the most valuable aspect of having a program for this type of simple calculation, which could have been done on a desk calculator, was that once the program was known to be correct, a large number of calculations could be performed without having to worry about arithmetic mistakes. Just as I finished the analysis of the vicinal coupling constants , I heard a lecture by R. V. Lemieux on the conformations of acetylated sugars. I do not remember why I went to the talk, because it was an organic chemistry lecture, and the chemistry department at Illinois was rigidly separated into divisions, which had a semiautonomous existence. Lemieux reported measurements of vicinal coupling constants and noted that there appeared to be a dihedral angle dependence, although the details of the behavior were not clear. The results were exciting to me because the experiments confirmed my theory, at least qualitatively, before it was even published. In spite of my concerns about the limitations of the model, the use of the equation has continued, and the original paper  is one of the Current Contents “most-cited papers in chemistry”; correspondingly, the 1963 paper was recently listed as one of the most-cited papers in the Journal of the American Chemical Society . The vicinal coupling constant model, which was developed primarily to understand deviations from perfect pairing, has been much more useful than I would have guessed. “In many ways my feeling about the uses and refinements of the Karplus equation is that of a proud father. I am very pleased to see all the nice things that the equation can do, but it is clear that it has grown up and now is living its own life” . At Illinois, my officemate was Aron Kuppermann. Our instructorship at Illinois was the first academic position for both of us, and we discussed science, as well as politics and culture, for hours on end. Aron and I decided that, although we were on the faculty, we wanted to continue to learn and would teach each other. I taught Aron about molecular electronic structure theory [we published two joint papers on molecular integrals] and Aron taught me about chemical kinetics, his primary area of research. Aron is officially an experimentalist, but he is also an excellent theoretician, as was demonstrated by his landmark quantum mechanical study of the H + H2 exchange reaction with George Schatz. This work was some years in the future (it was published in 1975), but in the late 1950s we both felt that it was time to go beyond descriptions of reactions in terms of the Arrhenius formulation based on the activation energy and pre-exponential factor. My research in this area had to wait until I moved to Columbia University, where I would have access to the required computer facilities. During the summer of 1960 I participated in an NSF program at Tufts University with the purpose of exposing high school and small college science teachers to faculty actively engaged in research. Ben Dailey, one of the organizers of the program, asked me one day whether I would consider joining the chemistry faculty at Columbia University, where he was a professor. Because I had already been at Illinois for four of the five years I had planned to stay there, I responded positively. I heard from Columbia shortly thereafter and received an offer to join the IBM Watson Scientific Laboratory with an adjunct associate professorship at Columbia. The Watson Scientific Laboratory was an unusual institution to be financed by a company like IBM. Although the laboratory played a role in the development of IBM computers, many of the scientists there were doing fundamental research. The Watson Laboratory had been founded in 1945 near the end of World War II to provide computing facilities needed by the Allies. It had a special attraction for me in that it had an IBM 650, an early digital computer, which was much more useful than the ILLIAC because of its greater speed, larger memory, and simpler (card) input. (No more nail polish!) I was to have access to considerable amounts of time on the IBM 650 and to receive support for postdocs, as well as other advantages over a regular Columbia faculty appointment. This was a seductive offer, but I hesitated about accepting a position that in any way depended on a company, even a large and stable one like IBM. This was based, in part, on my political outlook, but even more so on the fact that industry has as its primary objective making a profit, and all the rest is secondary. By contrast, my primary focus was on research and teaching, which are the essential aspects of a university, but not of industry. Consequently, I replied to Columbia and the Watson Lab that the offer was very appealing, but that I would consider it only if it included a tenured position in the chemistry department, even though I agreed initially to be at the Watson Lab as well. Columbia acceded to my request and after some further negotiation, I accepted the position for the fall of 1960. I continued research in the area of magnetic resonance after moving to New York. One reward of being at Columbia was the stimulation provided by interactions with new colleagues, such as George Fraenkel, Ben Dailey, Rich Bersohn, and Ron Breslow. Frequent discussions with them helped to broaden my view of chemistry. In particular, my interest in ESR was rekindled by George Fraenkel and we published several papers together, including a pioneering calculation of 13C hyperfine splittings . Although the techniques we used were rather crude, the results provide insights concerning the electronic structure of the molecules considered and aided in understanding the measurements. My interest in chemical reaction dynamics had deepened at Illinois through many discussions with Aron Kuppermann, as already mentioned, but I began to do research in the area only after moving to Columbia. There were several reasons for this. There is no point in undertaking a problem if the methodology and means for solving it are not available: It is important to feel that a problem is ripe for solution. (This has been a guiding rule for much of my research – there are many exciting and important problems, but only when one feels that they are ready to be solved should one invest the time to work on them. This rule has turned out to be even more important in the application of theory to biology, as we shall see later.) Given the availability of the IBM 650 at the Watson Lab, the very simple reaction, H + H2 → H2 + H, which involves an exchange of a hydrogen atom with a hydrogen molecule, could now be studied by theory at a relatively fundamental level. Moreover, early measurements made by Farkas & Farkas in 1935 of the rate of reaction over a wide temperature range provided important data for comparison with calculations. A second reason for focusing on chemical kinetics was that crossed molecular beam studies were beginning to provide much more detailed information about these reactions than had been available from gas phase or solution measurements. The pioneering experiments of Taylor & Datz opened up this new field in 1955. It made possible the study of individual collisions and the determination whether or not they were reactive. Thus, calculated reaction cross sections, rather than overall rate constants, could be compared directly with experimental data. To do a theoretical treatment of this or any other reaction (including the protein folding reaction), a knowledge of the potential energy of the system as a function of the atomic coordinates is required, as described in my Nobel Lecture. Richard Porter, a graduate student with F. T. Wall at Illinois, had done collinear collision calculations for the H + H2 reaction. Much impressed by Porter, I invited him to join my group at Columbia as a postdoctoral fellow. At Columbia, we rapidly developed a semi-empirical extension of the original Heitler-London surface for the H + H2 reaction, based on the method of diatomics in molecules and calibrated the surface with ab initio quantum calculations and experimental data for the reaction . This surface, which is known as the Porter-Karplus (PK) surface, has an accuracy and simplicity that led to its continued use in many reaction rate calculations by a variety of methods over the years. Within the approximation that classical mechanics is accurate for describing the atomic motions involved in the H + H2 reaction and that the semi-empirical Porter-Karplus surface is valid, a set of trajectories makes it possible to determine any and all reaction attributes, e.g., the reaction cross section as a function of the collision energy. The ultimate level of detail that can be achieved is an inherent attribute of this type of approach, which I was to exploit 15 years later in studies of the dynamics of macromolecules. Recently, I was pleased to learn that our paper was cited by George Schatz  as one of the key twentieth-century papers in theoretical chemistry. Schatz states, “The KPS paper stimulated research in several new directions and ultimately spawned new fields.” One of these as cited by Schatz was molecular dynamics simulations of biomolecules, as described in my Nobel Lecture. In 1965, it was time to move again. Columbia and New York City were stimulating places to live and work, but I felt that new colleagues in a different environment would help to keep my research productive. I had incorporated this idea into a “plan”: I would change schools every five years and when I changed schools I would also change my primary area of research. It was exciting for me to work on something new, where I had much to learn so as to stay mentally young and have new ideas. The initial qualitative insights obtained from relatively simple approaches to a new problem are often the most rewarding. I received numerous offers and decided to “return” to Harvard. After I had been at Harvard for only a short time, I realized that if I was ever to again take up my long-standing interest in biology I had to make a break with what had been thus far a successful and very busy research program in theoretical chemistry. On looking through the article, it was clear to me that the theory of the electronic absorption of retinal and its geometric changes on excitation, which play an essential role in vision, had not advanced significantly since my discussions with Hubbard and Wald during my undergraduate days at Harvard. I realized, in part from my time in Oxford with Coulson, that polyenes, such as retinal, were ideal systems for study by the available semi-empirical approaches; that is, if any biologically interesting system in which quantum effects are important could be treated adequately at that time, retinal was it. Barry Honig, who had received his PhD in theoretical chemistry working with Joshua Jortner, joined my research group at that time. He was the perfect candidate to work on the retinal problem. I will not elaborate on our studies here as they are outlined in my Nobel Lecture. Another scientific question that appeared ready for a more fundamental investigation was the origin of hemoglobin cooperativity, the model system for allosteric control in biology. Although the phenomenological model of Monod, Wyman, and Changeux had provided many insights, it did not attempt to make contact with the detailed structure of the molecule. In 1971 Max Perutz had just determined the X-ray structure of deoxy hemoglobin, which complemented his earlier results for oxy hemoglobin. By comparing the two structures, he was able to propose a qualitative molecular mechanism for the cooperativity. Alex Rich, now a professor at the Massachusetts Institute of Technology, had invited Perutz to present two lectures describing the X-ray data and his mechanism. After the second lecture, Alex suggested that I come to his office to have a discussion with Perutz. Perutz was sitting on a couch in Alex’s office and eating his customary banana. I asked him whether he had tried to formulate a quantitative thermodynamic mechanism based on his structural analysis. He said no and seemed very enthusiastic, although I was not sure whether he had understood what I meant. Having been taught by Pauling that until one expressed an idea in quantitative terms, it was not possible to test one’s results, I went away from our meeting thinking about the best way to proceed. Attila Szabo had recently joined my group as a graduate student, and the hemoglobin mechanism seemed like an ideal problem for his theoretical skills. The basic idea proposed by Perutz was that the hemoglobin molecule has two quaternary structures, R and T, in agreement with the ideas of Monod, Wyman, and Changeux; that there are two tertiary structures, liganded and unliganded for each of the subunits; and that the coupling between the two is introduced by certain salt bridges whose existence depended on both the tertiary and quaternary structures of the molecule. Moreover, some of the salt bridges depended on pH, which introduced the Bohr effect on the oxygen affinity of the subunits. These ideas were incorporated into the statistical mechanical model Szabo and I developed . It was a direct consequence of the formulation that the cooperativity parameter n (i.e., the Hill coefficient) varied with pH. This was in disagreement with the hemoglobin dogma at the time and led a number of the experimentalists in the field to initially disregard our model, which was subsequently confirmed by experiments. In 1969 I was invited to spend a semester at the Weizmann Institute and I joined the group of Schneior Lifson. While there, Chris Anfinsen visited and we had many discussions of his experiments on protein folding, which had led to the realization that proteins can refold in solution, independent of the ribosome and other aspects of the cellular environment. What most impressed me was Anfinsen’s film showing the folding of a protein with “flickering helices forming and dissolving and coming together to form stable substructures.” The film was a cartoon, but it led to my asking him, in the same vein as I had asked Perutz earlier about hemoglobin, whether he had thought of taking the ideas in the film and translating them into a quantitative model. Anfinsen said that he did not really know how he would do this, but to me it suggested an approach to the mechanism of protein folding. When David Weaver joined my group at Harvard, while on a sabbatical leave from Tufts, we developed what is now known as the diffusion-collision model for protein folding . Although it is a simplified coarse-grained description of the folding process, it showed how the search problem for the native state could be solved by a divide-and-conquer approach. Moreover, the diffusion-collision model made possible the estimation of folding rates. The model was ahead of its time because data to test it were not available. Only relatively recently have experimental studies demonstrated that the diffusion-collision model describes the folding mechanism of many helical proteins , as well as some others. When David Weaver and I developed the diffusion-collision model in 1975, protein folding was a rather esoteric subject of interest to a very small community of scientists. The field has been completely transformed in recent years because of its importance for understanding the large number of protein sequences available from genome projects and because of the realization that misfolding can lead to a wide range of human diseases; these diseases are found primarily in the older populations that form an ever-increasing portion of humanity. Over the past decade or so the mechanism of protein folding has been resolved, in principle. It is now understood that there are multiple pathways to the native state and that the bias on the free-energy surface, due to the greater stability of native-like versus nonnative contacts, is such that only a very small fraction of the total number of conformations is sampled in each folding trajectory . This understanding was achieved by the work of many scientists, but a crucial element was the study of lattice models of protein folding. Such toy models, as I like to call them, are simple enough to permit many folding trajectories to be calculated to make possible an analysis of the folding process and free-energy surface sampled by the trajectories . However, they are sufficiently complex so that they embody the Levinthal problem, i.e., there are many more configurations than could be visited during the calculated folding trajectory. The importance of such studies was in part psychological, in that even though the lattice model uses a simplified representation, “real” folding was demonstrated on a computer for the first time. An article based on a lecture at a meeting in Copenhagen  describes this change in attitude as a paradigm of scientific progress. When I visited Lifson’s group in 1969 there was considerable interest in developing empirical potential energy functions for small molecules. The novel idea was to use a functional form that could serve not only for calculating vibrational frequencies, as did the expansions of the potential about a known or assumed minimum-energy structure, but also for determining that structure. The so-called consistent force field (CCF) of Lifson and his coworkers, particularly Arieh Warshel, included nonbonded interaction terms so that the minimum-energy structure could be found after the energy terms had been appropriately calibrated. The possibility of using such energy functions for larger systems struck me as potentially very important for understanding biological macromolecules like proteins, though I did not begin working on this immediately. Once Attila Szabo had finished the statistical mechanical model of hemoglobin cooperativity, I realized that his work raised a number of questions that could be explored only with a method for calculating the energy of hemoglobin as a function of the atomic positions. No way of doing such a calculation existed. We decided the time was ripe to try to develop a program that would make it possible to take a given amino acid sequence (e.g., that of the hemoglobin alpha chain) and a set of coordinates (e.g., those obtained from the X-ray structure of deoxy hemoglobin) and to use this information to calculate the energy of the system and its derivatives as a function of the atomic positions. This could be used for perturbing the structure (e.g., by binding oxygen to the heme group) and finding a new structure by minimizing the energy. Developing the program a major task, but Gelin had the right combination of abilities to carry it out . He would have faced almost insurmountable difficulties in developing the program (pre-CHARMM) if there had not been prior work by others on protein energy calculations. Although many persons have contributed to the development of empirical potentials, the two major inputs to our work came from Schneior Lifson’s group at the Weizmann Institute and Harold Scheraga’s group at Cornell University. The CHARMM program is now being developed by a wide group of contributors, most of whom were students or postdoctoral fellows in my group; the program is distributed worldwide in both academic and commercial settings. Pre-CHARMM, while not trivial to use, was applied to a variety of problems. An early application of pre-CHARMMwas Dave Case’s simulation of ligand escape after photodissociation from myoglobin; a study that was followed by the work of Ron Elber, which gave rise to the locally enhanced sampling (LES) and multiple copy simultaneous search (MCSS) methods now widely used for drug design. Given that pre-CHARMMcould calculate the forces on the atoms of a protein, the next step was to use these forces in Newton’s equation to calculate the dynamics. This fundamental development was introduced in the mid-1970s when Andy McCammon joined my group. A basic assumption in initiating such studies was that potential functions could be constructed which were sufficiently accurate to give meaningful results for systems as complex as proteins or nucleic acids. In addition, it was necessary to assume that for these inhomogeneous systems, in contrast to the homogeneous character of even complex liquids like water, classical dynamics simulations of an attainable timescale (10 to 100 ps) could provide a useful sample of the phase space in the neighborhood of the native structure. There was no compelling evidence for either assumption in the early 1970s. When I discussed my plans with chemistry colleagues, they thought such calculations were impossible, given the difficulty of treating few atom systems accurately; biology colleagues felt that even if we could do such calculations, they would be a waste of time. The original simulation, published in 1977 , concerned the bovine pancreatic trypsin inhibitor (BPTI), which has served as the “hydrogen molecule” of protein dynamics because of its small size, high stability, and a relatively accurate X-ray structure; interestingly, the physiological function of BPTI remains unknown. This development, which played an essential role in the Nobel Prize, is described in my Nobel Lecture. The conceptual changes resulting from the early studies make one marvel at how much of great interest could be learned with so little – such poor potentials, such small systems, so little computer time. This is, of course, one of the great benefits of taking the initial, somewhat faltering steps in a new field in which the questions are qualitative rather than quantitative and any insights, even if crude, are better than none at all. As I read through what I have written, I see what a fragmentary picture it provides of my life, even my scientific life. Missing are innumerable interactions, most of which constructive but some not so, that have played significant roles in my career. The more than 250 graduate students and postdoctoral fellows who at one time or another have been members of the group are listed in my Nobel Lecture. Many have gone on to faculty positions and become leaders in their fields of research. They in turn are training students so I now have scientific children, grandchildren, and great-grandchildren all over the world. I treasure my contribution to their professional and personal careers, as much as the scientific advances we have made together. Contributing to the education of so many people in their formative years is a cardinal aspect of university life. My philosophy in graduate and postgraduate education has been to provide an environment where young scientists, once they have proved their ability, can develop their own ideas, as refined in discussions with me and aided by other members of the group. This fostered independence has been, I believe, an important element in the fact that so many of my students are now themselves outstanding researchers and faculty members. My role has been to guide them when problems arose and to instill in them the necessity of doing things in the best possible way, not to say that I succeeded with all of them. Discussing my scientific family makes me realize that another missing element is my personal family, an irreplaceable part of my life. Reba and Tammy, my two daughters whose mother, Susan, died in 1982, both became physicians (thereby fulfilling my destined role); Reba lives in Jerusalem, Israel, and Tammy lives Portland, Oregon. My wife, Marci, and our son, Mischa, who is an intern at the Harvard Kennedy School, complete my immediate family. As many people know, Marci also plays the pivotal role as the Laboratory Administrator, adding a spirit of continuity for the group and making possible our commuting between the Harvard and Strasbourg labs. Without my family, my life would have been an empty one, even with scientific success. The biography up to this point is based, as already mentioned, on an article published in 2006 . Molecular dynamics simulations have continued their rapid growth as a result of methodological improvements, force field refinements, and the availability of faster computers. The citation of methods for the study of complex systems in this year’s Nobel Prize in Chemistry will have the important consequence of legitimizing simulations and make likely their greater acceptance by experimentalists. The introduction of simplified potential functions, the specific focus of the Nobel Prize, certainly played a role in making possible molecular dynamics simulations of macromolecules. However, I am convinced that the latter are the essential element. I dedicated my Nobel Lecture to the 244 Karplusians who have worked in my “laboratory” in Illinois, Columbia, Harvard, Paris and Strasbourg. Without them, I would not have received the Nobel Prize in Chemistry. Over the last forty years, many of them have contributed to the methodology and applications of molecular dynamics simulations. I find it curious, as I state in the written version of my Nobel Lecture, that molecular dynamics simulations were not mentioned in the description of the “Scientific Background” of the Nobel Prize. The large community involved in molecular dynamics simulations, which includes all of this year’s Nobel Laureates in Chemistry, has transformed the field from an esoteric subject of interest to only a small group of specialists into a central element of modern chemistry and structural biology. Without molecular dynamics simulations and their explosive development, no Nobel Prize would have been awarded in this area. There is perhaps a parallel here between the fact that molecular dynamics was not mentioned in the Nobel Prize citation and the citation for Einstein’s Nobel Prize in Physics (1921). He was awarded the Nobel Prize for the theory of the photoelectric effect and not for his most important work, the general theory of relativity, which had already been verified by experiment and was the origin of his worldwide fame as a scientist. Interestingly, when he gave his Nobel Lecture, it was on relativity, even though he knew that he was supposed to talk about the photoelectric effect. Correspondingly, I traced the history of molecular dynamics simulations and their development in my lecture and did not emphasize the development of potential functions for simulations, the focus of the Chemistry Nobel Prize citation. The complex deliberations of the Physics Committee in reaching its decision concerning Einstein’s Nobel Prize are now known because his prize was awarded more than fifty years ago. The public will again have to wait fifty years to find out what motivated the Chemistry Committee in awarding this year’s Nobel Prize. This biolography is an abbreviated updated version of the article entitled, “Spinach on the Ceiling: A Theoretical Chemist’s Return to Biology,” Ann. Rev. Biophys. & Biomolecular Struc. 35, 1–47 (2006). It can be downloaded without cost. Honig B, Karplus M. 1971. Implications of torsional potential of retinal isomers for visual excitation. Nature 229, 558–560. Karplus M. 1959. Contact electron-spin interactions of nuclear magnetic moments. J. Chem. Phys. 30, 11–15. Karplus M. 1963. Vicinal proton coupling in nuclear magnetic resonance. J. Am. Chem. Soc. 85, 2870. Dalton L. 2003. Karplus Equation. Chem. Eng. News 81, 37–39. Karplus M. 1996. Theory of vicinal coupling constants. In Encyclopedia of Nuclear Magnetic Resonance. Vol. 1: Historical Perspectives, ed. DM Grant, RK Harris, pp. 420–422. New York: Wiley. Karplus M, Fraenkel GK. 1961. Theoretical interpretation of carbon-13 hyperfine interactions in electron spin resonance spectra. J. Chem. Phys. 35, 1312–1323. Porter RN, Karplus M. 1964. Potential energy surface for H3. J. Chem. Phys. 40, 1105–1115. Schatz GC. 2000. Perspective on “Exchange reactions with activation energy. I. Simple barrier potential for (H, H2)” J. Chem. Phys. 43:3259–3287. Theor. Chem. Acc. 103, 270–272. Szabo A, Karplus M. 1972. A mathematical model for structure-function relations in hemoglobin. J. Mol. Biol. 72, 163–197. Karplus M, Weaver DL. 1976. Protein-folding dynamics. Nature 260, 404–406. Islam SA, Karplus M, Weaver DL. 2004. The role of sequence and structure in protein folding kinetics: the diffusion-collision model applied to proteins L and G. Structure 12, 1833–1845. Dobson CM, Sali A, Karplus M.(1998). Protein Folding: A Perspective from Theory and Experiment, Angew. Chem. Int. Ed. 37, 868–893. Sali A, Shakhnovich E, Karplus M. 1994. How does a protein fold? Nature 369, 248–251. Karplus M. 1997. The Levinthal Paradox: yesterday and today. Fold. Des. 2, 569–576. Gelin, BR. April 1976. Application of Empirical Energy Functions to Conformational Problems in Biochemical Systems. Harvard PhD Thesis. McCammon JA, Gelin BR, Karplus M. 1977. Dynamics of folded proteins. Nature 267, 585–590.